“Look for it with your dogs under calm oaks or ancient elms, around the solemn willows or the spread robinia: when you see it emerging from the ground with all its majesty, you will but surrender to it,” from the site Unione delle Associazioni Trifulau Piemontesi. Aldo the trifulau and Micky the tabui. 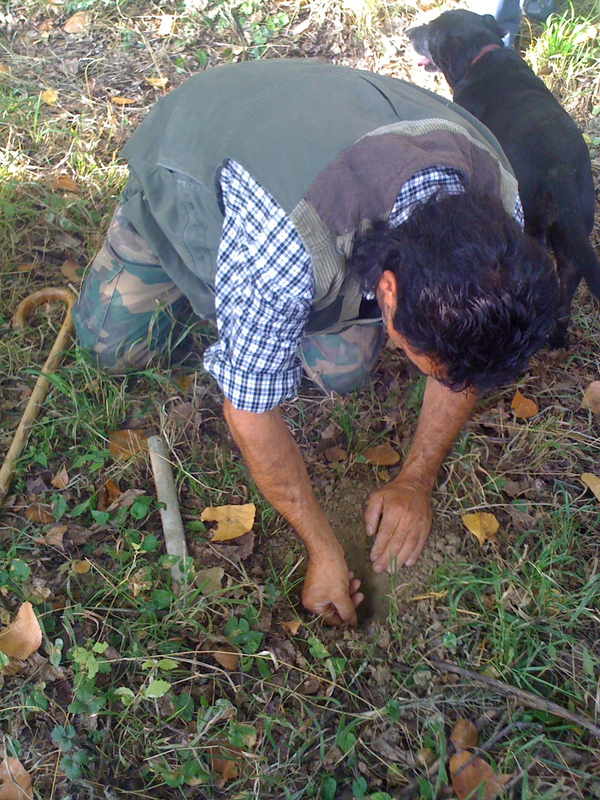 The components of a truffle hunt are: the trifula (the truffle), the trifulau (the truffle searcher) and the tabui (truffle dog). Hint: when working with fresh black truffles, they need to be slightly heated in order to bring out their flavor. Dogs can easily detect the scent of a truffle that is growing under the ground. So how do truffles grow and what are they exactly? Truffles start out as spores and grow amidst the roots of trees such as hazelnut, oak, poplar, willow and linden. Truffles do not attach themselves to root ends. They simply grow under the tree roots but not directly underneath the trees themselves. 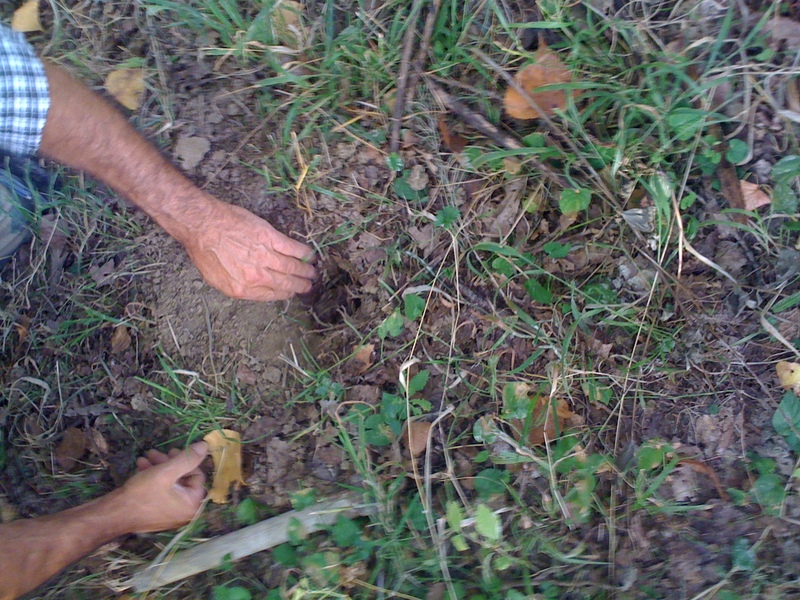 Once a truffle is collected it will continue to grow in the same spot year after year. The Latin name for a truffle is tuber, however, it is really a mushroom. When the weather is dry, the dogs need to keep their noses to the ground to pick up their scent. On the contrary, when the ground is damp and moist or when there is snow on the ground, all the dog needs to do is sniff the air. 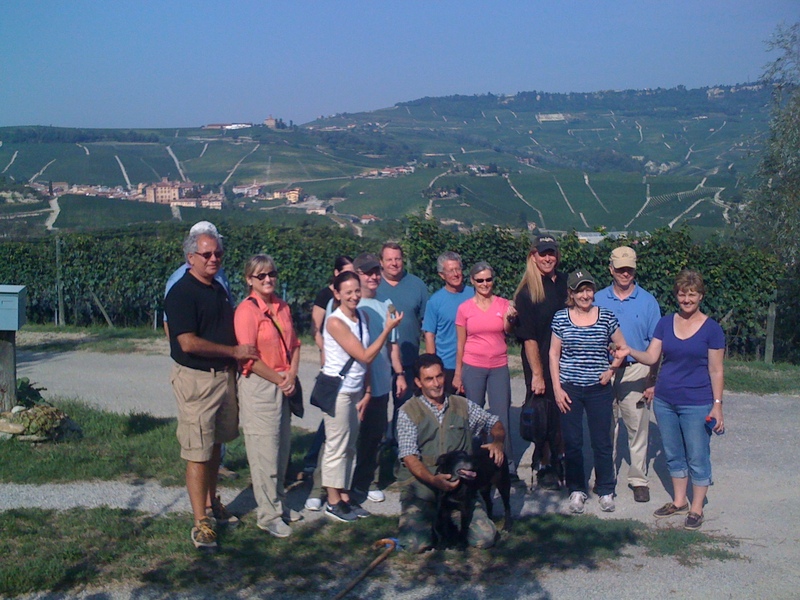 I had the pleasure of acting as a translator for a group of Americans hailing from the Metroplex or better known as The Big D, who came to The Langhe for a truffle hunt. Molto Formaggio organized their trip. Because of the fact that I lived near Dallas for 5 years, I felt like I had more in common with them besides the fact that all of us were foodies. I have to thank my dear friend Aldo whose sister Laura and brother-in-law Fernando own a company called I peccati di ciacco. 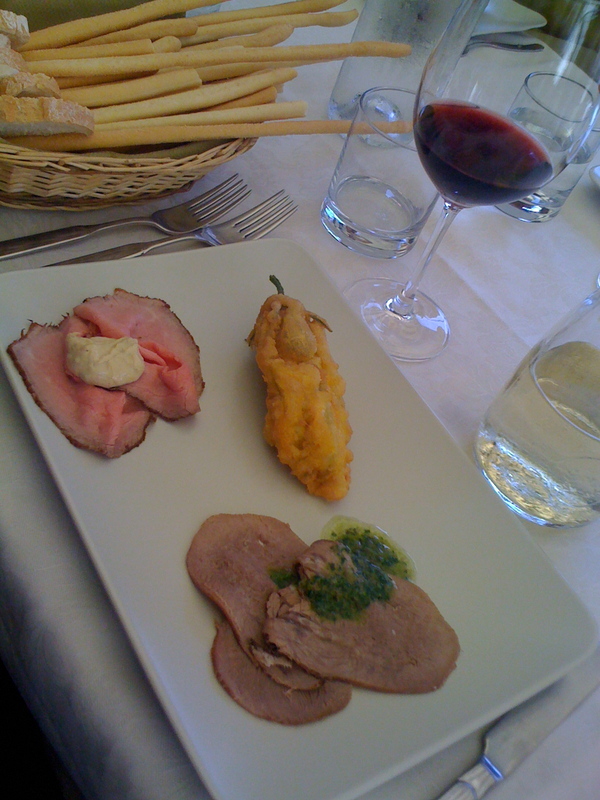 They are a company located in the heart of The Langhe and produce products using traditional Piemontese recipes. Due to a scheduling conflict he was unable to assist as a translator and so he referred me for the job. I am so happy he did! In fact, this is the sort of work I have wanted to do for such a long time. 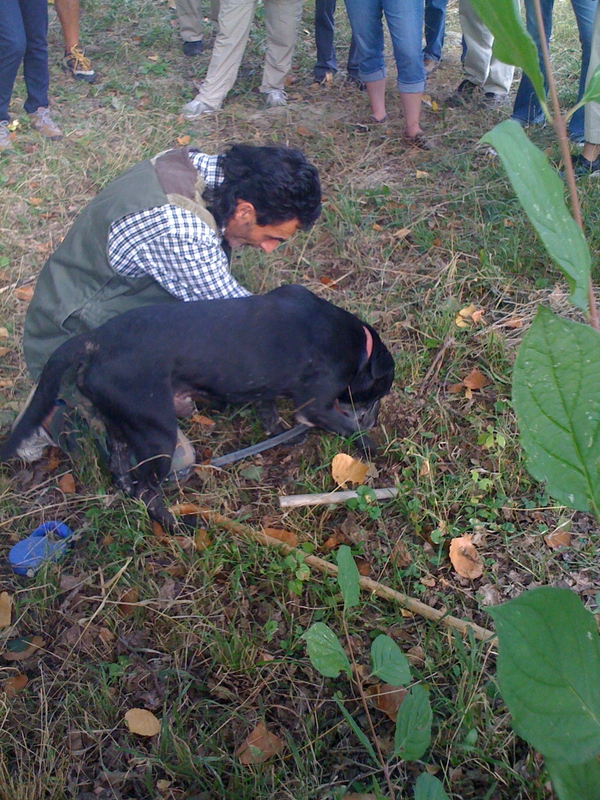 The “other” Aldo, was our trifulau or truffle searcher for the day. He trains the dogs himself and uses both male and female. We asked him if he thought male dogs were better than female dogs. At first he said they were equal but then he changed his mind and said that male dogs were better; although he did mention that one of his female dogs in particular was excellent at finding black truffles. Being the dog lover that I am I was pleased about how curious the guests from Texas were about the dogs that work these lands for such prized truffles. We discovered that in the past, mutts were used and now it seems the Labrador retriever holds reign. Aldo learned all of the traditions of a trifulau from his father. He explained that the dogs and their owners typically do their searches during the night, typically in the cold and damp weather of The Langhe. Some of the best truffles are found amongst the hillside rather than in the valley. So what does Aldo do in addition to being a trifulau? He’s a farmer and works his family’s vineyard. But during the off-season he travels to Cape Verde to do mission work. He has helped to plant trees, he said, and has also helped plant a vineyard. After the truffle hunt we took a quick trip to visit Aldo’s home to meet his sister who is a chef and their 91 year-old mother. We also met the other 5 dogs who work with Aldo during the season. One would think that with all the dogs around, they would be the ones to alert the family if a stranger might come wandering by. But, according to them, it’s all the ducks and geese that give the first warning. Living far from home made that day even more special for me. It was great to connect with my fellow countrymen and share a wonderful lunch with them at Locanda del centro in Castiglione Falletto. But most of all, I enjoyed sharing a part of my cultural experience of living in Italy with them. Saluti a tutti voi! This entry was posted in An American in Turin, Le Langhe, Piedmont, Rachel in Turin, Restaurants in Piedmont and tagged Le Langhe, Restaurants in Piedmont. Bookmark the permalink. I really enjoyed reading about the art of finding the truffle and your fun experience translating for your fellow Americans. Thanks for the fun story! Hello!How are things going? It’s good to know that you are still around this website. How did the last Google update affect your site? I took a look at your current rankings for this blog post and it seems that it’s all well for now! If there will be any problems be sure to get back to me, always loved your style Hope to see you soon!